heather and bilberry sometimes peppered with gorse - enliven the landscape, and are attractive to both people and wildlife. Cleared from woodland on poor acidic soils or where peat is thin, the purple-carpeted heaths are maintained by grazing and fires. Two forms of heathland are recognised - the upland heathland of the moors and lowland heath below this height. 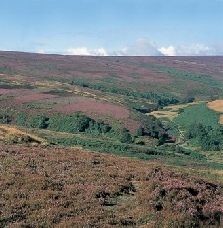 Upland heath covers extensive areas of the slopes of the Dark Peak moors in the west of Barnsley, above the enclosed pasture land. Due to the altitude and prevailing weather conditions, special communities of flora and fauna are found in the habitat: upland heathland is home, for whole or part of the year, to an impressive range of birds including Red Grouse, Merlin, ring ouzel, stonechat, Curlew, golden plover, dunlin, and snipe. The distinctive Mountain Hare is found here as well as the Common Lizard. Invertebrates are especially diverse and include emperor moth, Green Hairstreak Butterfly. 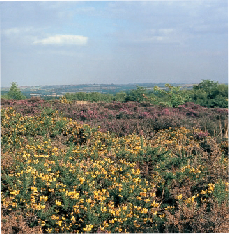 Lowland heath is rather scarce and fragmented in Barnsley, found on the edges of slopes of sandstone hills, on former commons, and even on former pit-stacks. The most significant areas of lowland heath are found on the slopes of hills near Penistone, Ingbirchworth and Thurlstone - including Black Moor Common, Hartcliffe Hill, Whitley Edge and High bank, Royd Moor and Small Shaw, and on Wharncliffe Chase. Houghton Common near West Haigh wood and Gypsy Marsh have small areas of lowland heath. It can also be found on some reclaimed tips such as Barrow and Littleworth Park. The scarce Nightjar uses lowland heathland as its primary habitat and heathland also supports Linnet, Whinchat, Stonechat and Wheatear. 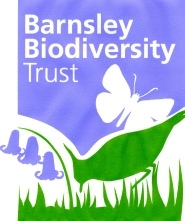 Brown hare and Common Lizard, are also found in this habitat as well as some highly specialised plants especially bryophytes and lichens, and invertebrates such as bumblebees and butterflies, including the green hairstreak.